Garbanimals, now there’s a name, inspired by the american scientist Curt Ebbesmeyer, who mapped ocean currents using plastic ducks and trainers washed overboard from container ships – tracing back to the date and place of sinking/cargo loss – found on beaches around the world …….. an interesting idea, even more so that he called himself an Ocean Garbologist. 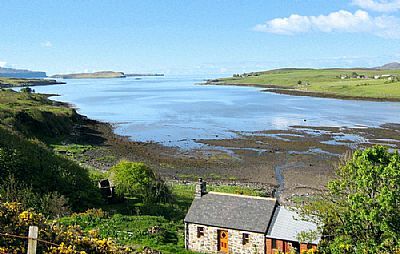 So, here we are on a small croft on the north-west of the Isle of Skye, at the head of Loch Caroy, a small arm of the larger Loch Bracadale. My inspiration for these animals comes from the excessive amounts of rubbish deposited on the local beaches and coastline from passing ships, fishing boats and possibly household waste. What do you find? Barrels, bottles, floats, nets, ropes, myriad things from our throwaway life. Since there is a law against throwing rubbish in the sea and thwarted by buck passing between various responsible bodies I decided to take matters into my own hands and produce these “animals” from rubbish found on local beaches and displayed them on various parts of the croft to draw attention to the state of our seas. In the past the people of these islands used seaweed to fertilize their growing areas – lazy beds – now I would imagine they would be shocked to see how polluted this resource has become. We have lived on this croft for twenty years, and recently noticed the amount of plastic being deposited increasing, once a depressing fact now turned into an intriguing idea – what can be done with such waste? Being a carpenter by trade I am now applying my skills to assembling tubes, barrels, bottles into comedic creatures. 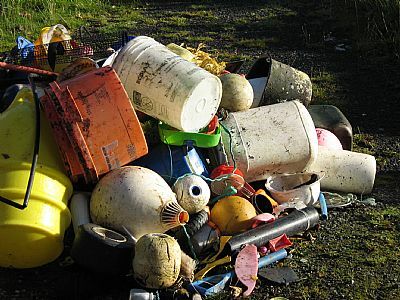 Wandering the beaches at low tide looking for interesting shaped articles, has now become a pastime, mainly walking or cycling from the croft seeing the intricate coast looking for the motherlode – piles of assorted gaily coloured waste piled into the unsuspecting zawns. The canadian canoe comes in handy for trips to local islands – coming back full on occasion. At the same time a new line has developed, Flotsanimals – from flotsam – inspired by shapes found in driftwood, with the application of shells and organic beach waste to produce mythic creatures.